Writing about Israel is tough when the Israeli-Arab conflict isn’t front and center. It’s been a geopolitical nightmare for decades; it hangs in the background during the discussion of even innocuous topics. But a massive new protest movement in Israel is centered around financial issues instead — and could give a sneak preview of what could happen if European and American economies hit the fan again. 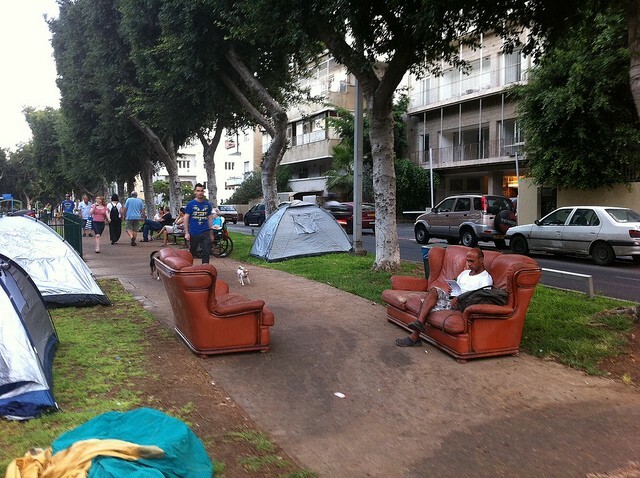 A gigantic tent city in downtown Tel Aviv was organized via Facebook and is now home to hundreds of protesters. They are mainly middle-class urbanites, angry at the rapidly rising Israeli cost of living and at Tel Aviv’s lack of affordable housing. These protest campers are regularly joined by tens of thousands of marchers who stop by for the day. Sister demonstrations rose up in Jerusalem and provincial cities like Haifa and Beersheba. Doctors and farmers by the thousands have announced that they are striking or protesting. Israeli-Palestinians (Palestinians inside Israel proper, rather than in the West Bank, have citizenship) have joined in the protests to demand better opportunities for their community. While it’s not the epoch-ending demonstrations of Tahrir Square or Tunis, it’s something. Unlike the demonstrations in Greece or Spain, the protesters aren’t just teens, 20-somethings and activist lifers. There are families with children, middle-aged professionals, seniors from the mainstream political parties. The only thing uniting them (well, most of them) is their demographic: Middle-class. Urban. Not particularly religious. Depending on their taste in music or books, they veer slightly yuppie or slightly hipster. The protesters’ demands aren’t Egyptesque calls for revolution or Paris ’68 style Situationist action. 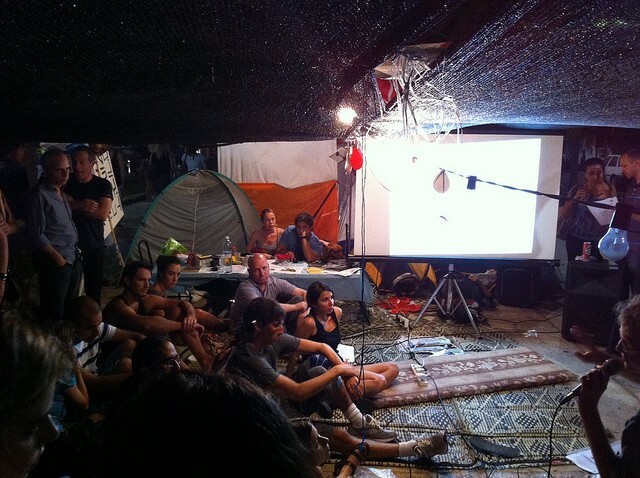 Instead, they’re more… amorphous; and the tent protesters and their sympathizers still have that middle-class ennui. There are calls for more affordable housing to be built in cities (Israeli rent/mortgage rates are sky-high and Netanyahu’s government prefers to build new housing in West Bank settlements instead), for lower food costs and for both politicians and the tycoons who dominate Israel’s hybrid socialist/capitalist economy to be held accountable. Israel has a low unemployment rate (5.7%), higher education is heavily subsidized and the children of Middle Eastern, North African and Russian immigrants have frequent opportunities to make it into the middle class. But having a job and social mobility does not count for much for Israelis who are dealing with a skyrocketing cost of living and a perpetual war in their backyard. The real problem for the Israelis seems to be discontent with the path their country is taking. Salaries in Israel are among the lowest of any industrialized nation, while housing costs in Tel Aviv and Jerusalem are equal to American cities like Atlanta and Seattle. Food costs have risen drastically over the past few years, leading to a tragicomically influential protest over the price of cottage cheese that helped spur the creation of the tent cities. Both Tel Aviv and Jerusalem lack subway systems or high-speed rapid transit and roads are packed for cars and buses; the middle class have to live in urban areas if they want to avoid massive commutes. If a professional were to move to the countryside (or do what the Israeli government wants and become a West Bank settler), decent-paying jobs simply wouldn’t be there. And compared to the United States, Israel’s consumer culture is dominated to a far greater degree by easy credit and all it entails. Due to the low salaries in Israel in comparison to, say, South Korea or France, credit reigns supreme. Banks and retailers commonly encourage customers to pay for all large purchases in set monthly installments. This even extends to small purchases; a supermarket customer in Israel can easily pay for a US$50.00 purchase in three installments. Israeli wallets are stretched even further by monthly payments for purchases that commonly exceed the average American credit card payment. That tends to make middle-class people angry. Israelis are sympathetic to the protesters. 88% of Israelis support them, including a significant right-wing contingent — the majority of Likud (Netanyahu’s party) and Shas (a quasi-theocratic right-wing party with strong roots among Jews of Yemeni and Moroccan descent) voters support the protesters as well. Since the protests are both popular and crossing across the traditional left-right divide, politicians of all stripes are attempting to co-opt them. Prime Minister Netanyahu announced that he would lower housing costs. The opposition Kadima party has embraced the protesters, while both far-left wing parties and Israeli neo-fascists have attempted to spread their gospel among the Tel Aviv crowds, to varying levels of success. Meanwhile, the foreign media has been slow to cover the protests. The fact is that, without a messy occupation with clearly defined “good guys” and “bad guys” and dead bodies lying around, stories don’t really become big news. But with the United States facing its own debt crisis and European Union economies such as Greece and Italy about to enter crisis mode, we’ve got years of middle-class protests coming up. It might be a good idea to take some notes from Tel Aviv just in case Rome or Paris is next. Neal Ungerleider reports on international technology for Fast Company and has been previously published in Slate, Foreign Policy and Wired. He lives in Jersey City, NJ and can be found on Twitter. Photos, taken in Tel Aviv, by Marc Berthold / Heinrich-Böll-Stiftung.